We hear all the time that Robots will be integrated into our lives everywhere; whether in hospitals, factories, banks or the agricultural industry. But aren’t we already surrounded by them? What makes the washing machine go round? What makes the light in the refrigerator turn on and the iRobot change direction when it’s facing a wall? Understanding the internal logic of the Robots we already have will help us engineer the Robots of tomorrow. In our course, Robotics for Kids, children will learn to code virtual 3D Robots. Just like using a flight simulator, your child will have a lot of fun coding Robots to navigate various 3D mazes while learning the foundations of mechanics, physics and engineering. Programming statements: if/else, loops, while and random. Variables: use variables to store information. We have a few starting dates so you can choose the class that suits your child’s schedule best. Our next class starts on Sunday, April 28 at 6:20 PM. If you are interested in one of our classes click on the schedule below to start the registration process. Grasp and define concepts such as: motion, speed and distance while coding in Blockly and in Java. 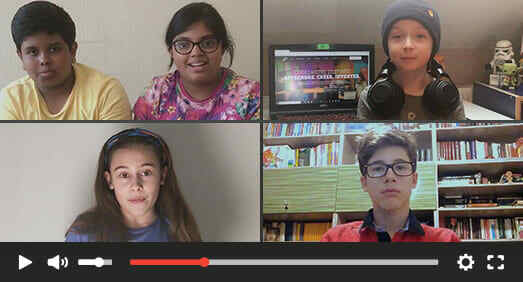 Kids have fun learning online, creating and being innovative with us. Don't take our word for it – listen to our students' experience! Students will get to know the learning environment and start coding virtual 3D Robots in Blockly (a block-based programming language). 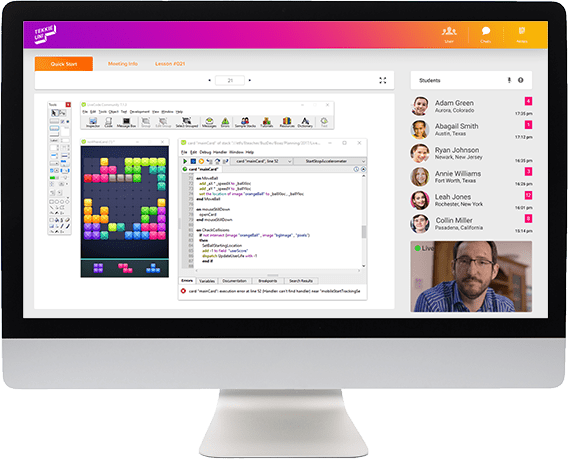 As they progress students will translate what they learn in Blockly to lines of code in Java. By the end of the course, kids will be writing smart code in Java and solving complex mazes using various sensors. With more than 20 scenes and mazes, kids will use the Coderz gamified environment to control their 3D virtual Robots through various obstacles, challenges and competitions. With more than 20 scenes and mazes, kids will use Coderz gamified environment to control their 3D virtual Robots through various obstacles, challenges and competitions. With more than 20 scenes and mazes, kids will use Coderz gamified environment to control their 3D virtual Robots through various obstacles, challenges and competitions. Welcome to Robotics! Students will get to know the development environment and the robot they will code. They will learn the following commands: drive forward, drive backwards and turn. Coding at this stage is done with Blockly (block-based programming). Keep on Moving Students will learn how to use Gyroscope, how to see the input in the HUD, and how to measure the effect of speed on driving accuracy. Time and Again Students will learn what a loop is, how to code it by using the same starting conditions and placing the command in the loop. Square Snail Students will learn what a variable is and how to use variables to store information. They will code the robot to create the course of a snail by measuring its increasing/decreasing radius. Touch and Go Students will learn what a touch sensor is and how to use it in order to change the driving route. They will code the robot to overcome obstacles in the maze, while using the touch sensor. Zig Zag Students will get to know color sensor and speed\distance sensor (tachometer). They will learn how to calculate the driving distance by measuring the ratio between the motor's turning angle and the wheel's perimeter. Welcome to Java! Students will be introduced to a new development environment called Java. 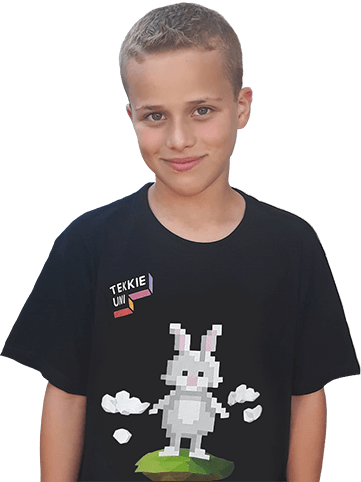 They will start writing simple code and step by step they will translate what they learned in Blockly to code in Java. Students will practice writing in the new environment, by solving new and complex mazes in various scenes. Final Project In the last unit, students will be exposed to a new robot configuration. The robot will have two sensors. They will use the proportional control algorithm to oversee the robot's speed. Students will also solve the last and most complex maze. They will decide which sensor to use and when to use it, in order to get the best results in the shortest time. Learning is all about connecting. That's why we use video conference software allowing small groups of children to get to know each other and their teacher. 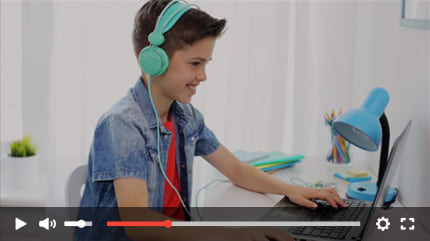 The teacher uses a shared screen option so everyone can see what s/he is doing on her desktop, and kids can fully participate in the lesson by using the microphone or the chat option. In addition to the weekly live lessons, students are invited to join a live weekly Q&A session with a teacher present in class. The session is dedicated to providing personal assistance with students' projects, exercises and answering their questions. All the live lessons and practice sessions are automatically recorded and available for students during the course. Students learn by participating and working on interest-based projects, which creates a fun class dynamic where we don't present the answers, but rather look for them together. Interested in our Robotics for Kids program? We invite all new students to try a few sessions for a nominal fee that will be fully refunded in case you decide not to continue after the trial period, for further information regarding cancellation policy click here. Class time zones- what time your classes start? We teach Monday to Friday according to your local time zone. You are welcome to check the schedule and assign yourself to a time that’s most comfortable for you. We teach kids from ages 8-17. You are welcome to check the specific age group for each course in the course page. All the lessons and practice sessions are automatically recorded. We encourage parents to view the recordings and share their feedback. You can also write an email to the child’s teacher and hear more about him. You can email us at customercare@eteachergroup.com or call us at: +1-646-233-4171 before the end of the 14-day trial and we will reimburse you. No. After the 14-day trial just show up to the next lesson and the rest of the payments will be charged automatically.